This week I am going to continue to build (and finish) my board on board cedar fence. If you are just joining me, in PART 1 I extended the existing steel poles, demoed the old fence, and hung the stringers for the new. In PART 2 I explained how I installed a top cap, attached all the pickets for the board on board pattern, and finished it off with trim. Nooow I am going to be diving into how I built boxes to go around the steel posts, decorate them with trim, and also build a gate. Let’s get to it! Our local city ordinance requires the “finished side” of a privacy fence to face the street; this means the post side obviously faces the inside of the yard. Honestly, my husband and I both really wanted all three sides of our fence to match in the back yard. So, we made the decision to build the fence so that all three sides are built with the poles facing our yard which brings us to the topic of building artificial columns around each one of the 38 posts. Building the boxes around the posts is totally optional. Rather than have the nice looking cedar fence material interrupted by bright silver posts, brackets, and hardware, I really liked the idea of having a faux (or “artificial”) column at each post. All of the brackets are bright silver and measure about 12″ wide. This means if I wanted the brackets to be completely hidden by the boxes, they would have to be about 12 inches wide….which is not realistic. I wanted the boxes to be only as big as they had to be, which is around 5″ wide. This means if you’re looking at the front of the column, the left and right side of the brackets will be exposed and the silver finish would stick out like a sore thumb. My solution to this was to paint the brackets brown to camouflage them better. I came up with a small cardboard template to place around each bracket so the cedar stringer didn’t get much over spray on them. I sprayed them with a rusty brownish red color by Rustoleum which is intended for outdoor use and was the closest match I could find at the local big box store. With all of these painted I moved on to figuring out how to attach the boxes to the posts. I will be using three pickets to make up the boxes so I decided to attach the two side pickets directly to the sides of the posts by using some self tapping screws. To make driving in these screws easier I would first hold the picket in place and drill a hole through it until my bit (size: 9/64) touched the metal pole behind it. I then moved the picket aside so I could put all my effort into making a hole in the post. My posts are made from 3/16″ steel so it took a little persuading. Once the three holes were drilled, I set the picket back into place and drove in the three self tapping screws. After I got one side done I repeated for the other. Now on the two side pickets I used the full size picket, however for the front I had to rip it down to 5″. Most people don’t have these crazy 3 1/2″ steel poles so before getting started just measure to see how wide you need each picket then use a table saw to rip down the boards to the size needed. To attach the front picket I used some construction adhesive and 1 1/4″ 18ga brad nails. I didn’t use my siding nailer (that I used to attach the pickets) because I didn’t want to end up cracking/splitting the pickets by trying to attach them. These posts aren’t structural, they are purely for looks, so a little adhesive and brad nails will do just fine. All three pickets were placed flush with the bottom of the top plate just like the board on board pickets on the rest of the fence. Note: It’s worth mentioning that our poles are not a common size or thickness with regard to your “typical” fence post (i.e. most fence posts are 2-3/8″ in diameter and approximately .060″ thick). If you are replicating this project, the self-tapping screw step may not apply to your project. Instead you might be able to drive your screws in directly without needing to predrill. I would first cut the 2×8 to 10″ long and centered it on the top of the three pickets covering the post. For my size of boxes this leaves a 2 1/2″ overhang on both the left and right. 10″ may seem like a lot but the trim I plan to add will take up 1″ on each side. Before attaching the top, I cut a 45 on the two front corners for aesthetics. I did this with a miter saw. I then permanently attached the top by “toe-nailing” 2-1/2″ exterior wood screws into the 2×6 top plate of the fence. Note: I find toenailing screws easier if I predrill first however another option would be to use a pocket hole jig if you have one. After the 2×8 is attached, then it was time for a little trim to finish it out. I created all of the trim by ripping down the rejected pickets at my table saw. The first layer of trim is 3-1/2″ tall and is butted to the bottom of the column top. The next layer is 1-3/4″ tall and it is also butted to the bottom of the column top. I picked these numbers based off the thickness of my top cap material but of course all the trim work is customizable to your preferences. The trim are all attached with construction adhesive and 1-1/4″ 18 gauge brad nails. Like all first time projects, the first column took the longest since I was spending a lot of time deciding on the design, criticizing the design, and then figuring out the best means of replicating it 37 more times. : ) However, once I was happy with everything, I jotted down the dimensions of the trim and column top, rounded up a pile of material, then stood at the miter saw and cut 37 poles worth of wood. Once it was all cut, I distributed the material around the fence at each posts and simply moved myself and my tools from pole to pole knocking out each one as I went along. Tip: For this step don’t forget to utilize a stop block at the miter saw. It makes quick work of replicating cuts. However, remember when using a stop block at the miter that when you make the cut you need to be holding the piece of wood that is between the stop block and the blade. This is the piece that is in a position to get into a bind and get kicked back at you. To save time (and energy) I enlisted Cody to handle all of the pre-drilling for the self-tapping screws and attaching the first two pickets on the left and right sides of the posts. This allowed me to simply move from one post to the next, attach the front picket, attach the column top, and finally secure the trim in place. Admittedly, we had a very efficient system going and even though it was about 102 degrees outside, the time seemed to pass along very quickly. The final touch on the posts comes in the way of protecting the bottom of them. A company named “Fence Armor” recently reached out and supplied me with enough of their product to protect the bottom of all 38 of my columns. Their product is a low profile bracket that slips onto the bottom of each posts with the intentions of protecting it from getting damaged by weed trimmers. 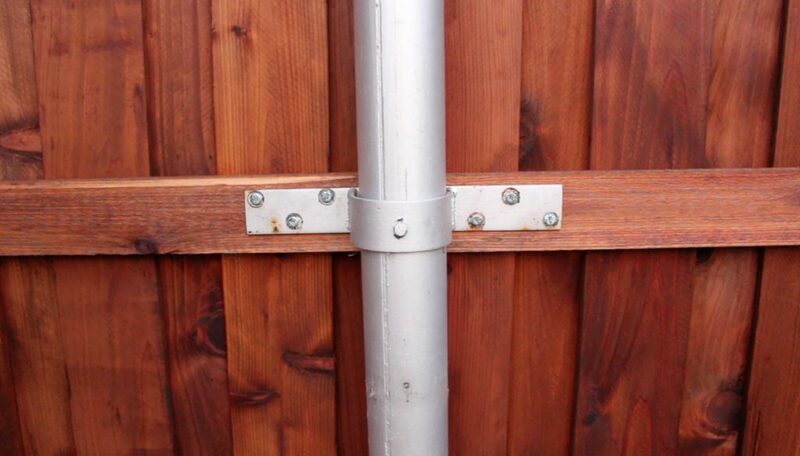 Basically, their product is a protective 22g steel plate which is bent into a C-channel shape and has a few screw holes punched in them for attachment to the bottom of your fence posts. I got all of mine in their “Red Wood” color which is a very close match to the red-ish color of my cedar fence. I would recommend this product to any one interested in protecting their investment from damage due to lawn equipment. Ok and thats it for how to add the boxes! As you can see, they turned out wonderfully! Cody and I could not be happier and both agree that the post side of the fence is actually more attractive than the picket side. We are so pleased with how the columns break up the space and really give the backside of the fence a finished look. It was an entire day’s worth of extra work but since a fence doesn’t need replacing for 20+ years, I’m glad we put in the extra effort. Now – time to tackle building a gate! As you can see the old gate, like the rest of the old fence, was well past its intended service life. When building the fence you may have noticed that I did not demo the entire fence at one time since I have three little critters who like to leave the back yard on occasion. With this in mind, the gate section was the very last thing to be removed and replaced. Additionally, I knew very well the construction of the gate would take quite a bit of time since I have never built a gate before. So lets jump into the details! For me, the process for building my gate boiled down to the following few steps: Measure the gate opening. Attach the stringers on both sides of the gate opening. Secure the top cap which will move with the gate. Build and precisely hang the gate frame in position. Cover the gate frame with pickets. Attach the hinges. Cut clearance holes for the latch. Cut the clearances for the top cap. Open and enjoy my new gate. If your repeating this project, it’s a really good idea to start with a nice, square opening so you don’t have all kinds of issues later on when it comes to hanging the gate or the gate swinging open incorrectly. The two posts that make up the gate opening in the fence are nice and plum already. Had the posts been majorly out of plumb, I would have removed and replaced them. Note: You’ll notice that when installing the top cap in this section we left the joint solid above the gate opening. This is intentional and I recommend this method. It allows you to build the gate in position and then cut it loose at the very end. Instead of building the gate on the ground and trying to hang it after the fact. Both ways will work but I can tell you that this way was super easy and precise. I have seen some fences that feature a top cap like mine but the builder skips the top cap all together above the gate. This is probably because they do not want to mess with cutting in the top cap and figuring out how to make proper clearance for the top cap to move with the gate and not have any interference. Personally, I do not like the way these gates look since there is a huge interruption in the pattern of the fence when it comes to the gate; so, mine will get a top cap! I started by installing the left side top cap and ensured it was flush with the ends of the stringers. The right side was a bit different; the right side top cap spans from the corner of the fence, all the way across the gate opening, and butts up against the left side top cap. I started by taking some measurements. From side to side my gate opening is 48″. I decided to give the frame a 1 inch gap on both sides making my frame width right at 46″. The height of the gate frame is equal to the distance from top stringer to bottom stringer which happens to be 67″. Note: When the gate is complete, the goal is for the gate to appear as one continuous portion of the fence. By making the top and bottom horizontals of the gate frame in line with the top and bottom stringers, the nails on the gate pickets will fall right in line with the nails of the fence pickets. With the dimensions I needed for the frame, I grabbed some 2x4s and started cutting the material to size. Now if you go searching around you will find a wide variety of how gates should be built, what type of corner joinery is best, so on and so on. Keep in mind I am no professional, but have specific reasons for my methods. Ultimately, the choice is yours on how you build your gate frame. I chose to use half lap joints at the corners because of the large amount of board-to-board surface area. Half laps can be done either with a circular saw or a table saw. I used a table saw and threw in the dado stack to speed things up. I cut my half laps 3-1/2” by 3/4” deep on all 4 boards. Once all the boards were cut, I laid the material on the flat shop floor and mocked the pieces together. Before securing the pieces together, I double checked the dimensions of the material, double checked the diagonals for square, then permanently attached everything together. In addition to the (4) 1-1/4” exterior screws I used at each joint, I also applied exterior rated wood glue. Note: I like to use the corner jigs shown in the image below to help ensure the corners are nice and square before permanently attaching the material. The last piece of the frame is the diagonal. So I actually ran out of 2×4’s for this job but I did have a nice piece of cedar 2×6 left over so I decided to put it to use for my cross member. The diagonal has a very important job in supporting the shear load due to the weight of the gate acting on the hinges as well as the joinery. Rather than measure the length of the diagonal, it is best to place a couple of 2×4 blocks under the frame, slide the diagonal board under the frame and into position, then mark the cut line made. Once the diagonal is cut, I glued and toenailed it in place using three exterior 2 1/2″ screws per side. Note: Last point on the diagonal – when you’re sliding the diagonal under the frame to mark your cut line, you want to be sure the diagonal is mating up to the top and bottom of the frame and not the sides (see image below). This is an important detail because you want the hanging load of the fence to be transferred to the lower hinge by way of the diagonal. Now that the frame is done, it was time to hang it! I got up on a ladder with a couple of clamps and Cody carried the frame over to the fence opening. Now before hanging the frame…..it will need to be set back from the edge of the inside edge of the top cap by 1 1/2″. To make it easier to get into place I used a pencil to make a reference line on the bottom side of the top cap. Cody lined the frame up to the reference line and I set a used a bar clamps to hold it in place. Once the frame was roughly held in place, I moved it left and right until I had 1″ on either side of the frame. Once I was happy with it, I tightened up on the clamps and set the frame in place with about (4) 3-1/2” exterior screws. So the frame didn’t exactly hang perfectly straight up and down; the bottom was kind of leaning in toward the inside of the back yard. No big deal. To square it up to the stringers, I used some scraps to “scab” the frame to the bottom and top stringers so that the outside of the frame was nice and planar to the outside of the stringers. These pieces are just temporary, until I get the outside picketed. Now that the frame is in position I can easily get that middle “stringer” added to the frame. To do this I simply lined up a scrap 2×4 to the middle stringer on the fence, made sure it was level, then marked the cut line where the board crossed over the vertical and diagonal members of the gate frame. I did this for both the sides of the diagonal so the middle gate stringer is basically continuous from one side of the gate to the other. By these boards being perfectly in line with the other stringers, you will have good meat to run in your hardware that comes with the gate hinges. Time to throw on some pickets! So my motivated husband worked ahead of me putting up pickets to the left and right of the gate opening while I was handling the gate frame….which is nice : ) However we realized by working ahead, some of the spacing did not work out perfectly when I went to put the pickets on the gate. Nonetheless we made it work. As you can see in the image below, we had to fudge the spacing a bit but it is barely noticeable in my opinion. If you are doing this job on your own just learn from our mistake and picket the entire side as one instead of doing either side of the gate and trying to fill it in. Now I attached the hinges. Two of the bolt holes on the hinges happen to fall over a gap in the picketing. We remedied this problem by tracing the shape of the hinge on a picket, cut them out using a bandsaw, then slipped them behind the hinge where the gap was. This way, when the lag bolt for the hinge is snugged down tight, the hinge will not want to bow inward toward the gap and will instead remain nice and flat when its tightened down. As you can see, it’s really not even noticeable. Once all of the hinges are secured in place, the gate can be cut loose from the top cap. You can make a 90 degree cut however I decided to cut my top cap at about a 45 degree angle. Aside from looking a little better in my opinion, the gate will open without the chance of the top cap binding up. I made this cut with my circular saw. Note: Be sure to check and set the depth of your saw before making this cut, you only want it cutting through the top cap material. Also, be mindful of where your screws are that you used to set the gate frame in place. Ok now at this point the gate still can’t swing open because the top cap on the hinged side of the gate interferes with itself. So a relief cut is required on this side as well to allow the gate to fully open without binding. This relief cut is made up of two cuts and I again used my circular saw. However, since the cuts do not go all the way through I only used the circular saw to make the majority of the cut then my oscillating multi tool to finish it off. At this point I tested the gate out and was thrilled that it opened and closed perfectly! And if you’re wondering, no, the gate frame did not sag one bit whenever the gate was cut loose. With the gate working I am calling this project a wrap! It’s been a very long and exhausting process however the fence looks so beautiful and since we didn’t have to hire it out, we saved thousands of dollars. With that said, lets get into a cost breakdown of what the entire project actually cost. I know $5,800 is a lot of money however when we were getting a quote to hire the job out we were told by three companies it would cost $11,000 and those quotes did not include the cost of extending the poles or boxing them in. So if we were to include these two things I bet the quote would have been over $12,000. With that said, we saved a lot of money by tackling this job ourselves. It’s a lot of hard work, not because the steps are technically difficult, but just because of the size of the job (and the heat since it’s summer right now). With that said, this job is 100% manageable for an average DIYer. My advice to you would be to schedule the project during a time where you won’t have to rush through it and get overwhelmed by the process. You can roughly count on every step of the process taking at least a day to complete. I hope that by sharing my experience with you, that it helps out! Below is a short video showing a few before and after shots of the fence, what a difference….